those still sans-Timeline “will receive a notification on their Profile if they want to ‘Get Timeline’ or they can visit www.facebook.com/about/timeline.” Giddyup. So check under your trees, everyone! Do you have it? Do you have it? With our economy, this might be the coolest thing you get this Holiday Season! We thought it was a stellar redesignwhen we reviewed it months ago and it still is—but today will mark a great global wave of complaining. Get ready for a lot of whiny status updates. OMG HATIN’ THE NEW FACEBOK, WTF IS THIS??? In The Social Network, Movie Mark Zuckerberg describes his project as the entire college social scene, put online. In a sense, he completely pulled it off. Now Real Zuck’s lept beyond beer pong: your entire existence, Facebook-ified. It’s terrifyingly amazing. This is the single greatest change that Facebook’s ever pushed on us—and soon it’ll be pushed to 750 million human beings around the planet. Facebook wants Timeline, which is going to completely replace the iconic Facebook Profile, to represent your entire life. It’ll be a visual history of your existence, starting at your birth. Yes, the fact that you came out of your mother (and when! and where!) is now noted on Facebook’s servers. Love, loss, friends, frenemies, birthdays, breakups, cats, kegstands—all of it, from zeroday to today, shared with everyone you know online. This is simply the single most ambitious attempt to catalog the tangled mass of human lives in the history of the internet. 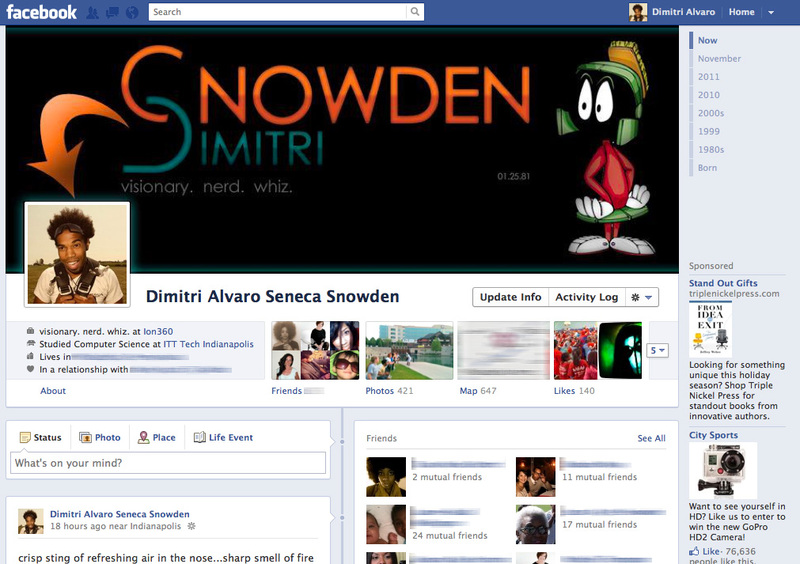 Facebook Timeline is beautiful, and that’s something I don’t think I’ve ever said about Facebook. Most of the site’s updates have been haphazard, glued together like the work of an engineering masquerading as a graphic designer with severe personality disorder. The legacy of psychotically unfriendly, entirely irrational new features ends here. Timeline not only looks wonderful, but it’s wonderful to use. The chronological stream of the Old Wall remains, but is supplemented by everything you’ve ever done or participated in on Facebook: status updates, wall posts, photo tags. Everything is there, enlarged, and unmissable. The further you scroll down, the further into your past you go. Months and years speed by—your first roommate, college graduation, your 21st birthday—and then, the day you were born. If anything’s missing, you can manually add “life events” to the list (marriages, awards, graduations), making it as rich, accurate—and creepy—as you’d like. The more work you put in, the more amazingly furnished with yourself Timeline becomes. Facebook Timeline is capable of triggering poignant emotional responses. Not just, Ugh, I can’t stand that guy, which is the usual. But watching my life literally scroll before my eyes is something I’d never seen before. Facebook’s always been the nostalgic’s deepest hole, but now it doesn’t feel like you’re digging for scraps of sentiment—Facebook’s organized it for you, and presented it gorgeously. If the old Facebook was a shoebox of polaroids and cheap souvenirs strung together with ratty blue and white yarn, Timeline is a leather-bound, high resolution photo album for your mantle. It’s easy to move around the Facebook-transposed version of your life. Easy to share what you want, revisit the things you loved, even the things that kind of sucked, and think about how glad you are to not be a college freshman anymore. And it’s a complete pleasure to stare at. The revamped “cover image” atop your profile is a beautiful eCountenance, with all the rest of your biography summarized neatly below. Facebook no longer feels like a list of musty JPEGs and text blurbs—it feels like a monument to yourself, and to how incredibly far you’ve come. For a company in the business of celebrating the ego, this is the apotheosis of the self. Put on your laurels, and gaze at a million versions of the kid you used to be. There are strange lapses in the Timeline Museum of the Self. It’s still in pre-release, so it’s possible to chalk all of this up to bugs. But why are giant chunks of tagged photos vacant in certain months of my life? I know they’re there—I can view them in the standard photo browser. Why are certain areas dominated by my freshman year girlfriend? I know I was talking to other people. Right? This strikes me as the symptoms of a screwy algorithm, but until then, it detracts from the time tour. There’s also a certain element of lost control in Timeline. The old Facebook was simple to the point of sterility. It was segmented. It was spartan. Here are your photos. If it was an orderly orchard before, now it’s a fruit salad. Timeline’s a mix of everything—everything. That’s ultimately its virtue, but for those who liked the order the old design, anxiety levels might peak. Timeline is a little messy—but hey, so’s life. Unless you want to bail on Facebook, you don’t have a choice. In the coming weeks, it’ll be pushed across the entire network uniformly. The question is, do you want to stay onboard, given the direction Facebook’s moving? Timeline is great, but imperfect. It’ll get better. Still, the fundamental question remains: Do you want to funnel in the parts of your life it hasn’t appropriated already? Do you want it to transcribe all the songs you’ll listen to, the restaurants you’ll hate, the “illnesses you’ll overcome” (an actual, bizarre event choice)? If the notion of the digitized self pleases you, Facebook is your best new altar. If you find it depressing, demeaning, and superficial, then frankly, you should turn it off now. Zuckerberg wants Facebook to devour and digest the world, using your life events as its nutrients, the existential feces left behind fertilizing a high resolution, pristine Timeline. His appetite’s only going to grow—the question is if you’ll enjoy dining with him. The answer ought to be yes. Timeline is an enormous leap for social networking per se, and an invaluably illuminating testament to what humans are making themselves every day. It’s exciting, comforting, and friendly. Timeline is you. This entry was posted in strategy, technology and tagged Brand, business strategy, dimitri, dimitri snowden, Facebook, Facebook Timeline, ion360, JPEG, Mark Zuckerberg, Marketing, New Zealand, Personality disorder, smart business, snowden, Social network, strategy, Timeline by dimitri seneca snowden. Bookmark the permalink. This is true Navneet! Social interaction are being recalibrated by technology every day! Thanks for the recommendations you have discussed here. One more thing I would like to talk about is that pc memory requirements generally go up along with other breakthroughs in the technologies. For instance, whenever new generations of processor chips are brought to the market, there’s usually a corresponding increase in the type calls for of all pc memory and hard drive space. This is because the program operated through these processor chips will inevitably rise in power to use the new technological know-how.